Two works by John Locke were selected to be part of Thomas Hollis's "Library of Liberty" which he distributed to libraries and individuals across Europe and America in the 1760s and 1770s. He was regarded as a key theorist of the republican and commonwealthman tradition of the late 17th and early 18th centuries in the struggle for individual liberty, constitutional government, and the abolition of corruption. Locke's Two Treatises of Government (1764) was reprinted by Hollis in 1764 with his characteristic symbols of liberty adorning the text (the illustration of the author with laurel wreath, liberty cap, and appropiate quotation selected by Hollis). The image of Locke was also distributed as a stand alone "postcard". According to Caroline Robbin's categorization of Hollis's texts Locke's Two Treatises of Government was one of the 11 "canonical" authors and 13 texts which he assembled "for the use of the Swedes" in 1772. 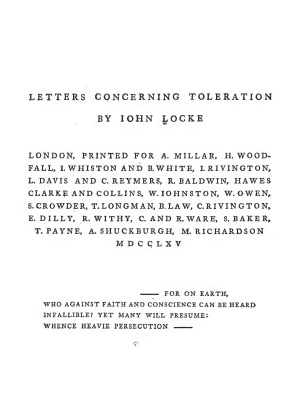 Another of Locke's books, Letters concerning Toleration (1765) was regarded by Robbins as being "near canonical" as it was one of those "books so frequently quoted or dispersed by Hollis as to appear Canonical" (30 titles). George Buchanan (1506-1582), De iure regni apud Scotos (1579) [edition projected by Hollis]. Christopher Goodman (1520?-1603), How Superior Powers Oght to be Obeyd of the Subjects; Where-in they may be lawfully by Gods Worde be disobeyed and resisted (1558). James Harrington (1611-1677), The Common-Wealth of Oceana (1656) [edition projected by Hollis]. François Hotman (1524-1590), Francogallia (1573) translated into English by Molesworth 1721. 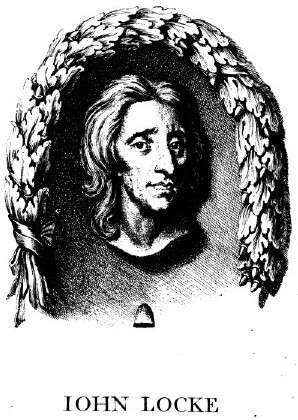 John Locke (1632-1704), Two Treatises of Government (1690). John Milton (1608-1674), Areopagitica; a Speech for the Liberty of Unlicenc'd Printing, to the Parliament of England (1644). ----, Pro populo anglicano defensio contra Claudii Anonymi, alias Salmasii defensionem regiam (1651). ----, The Tenure of Kings and Magistrates: Proving that it is Lawfull to call to Account a Tyrant, or Wicked King (1649). Robert Molesworth (1656-1725), An Account of Denmark as it was in the Year 1692 (1694). Marchamont Nedham (1620-1678), The Excellence of a Free-State: or, the Right Constitution of a Commonwealth (1656). John Ponet (1514?-1556), A Short Treatise of Politicke Power, and of the True Obedience which Subjects owe to Kynges and Other Civile Governours (1556). John Trenchard (1662-1723), A Short History of Standing Armies in England (1698). [Languet], Vindiciae, contra tyrannos: sive, De principis in populum, populique in principem, legitima potestate (1579). John Brown (1715-1766), An Estimate of the Manners and Principles of the Times (1757). James Harris (1709-1780), Hermes: or, a Philosophical Inquiry concerning Language and Universal Grammar (1751). -----, Three Treatises. The First concerning Art. The Second concerning Music, Painting, and Poetry. The Third concerning Happiness (1744). William Harris (1720-1770), An Historical and Critical Account of the Life and Writings of James I (1753). ----, An Historical and Critical Account of the Life and Writings of Charles I (1758). ----, An Historical and Critical Account of the Life and Writings of Oliver Cromwell (1762). ----, An Historical and Critical Account of the Life and Writings of Charles II (1766) 2 vols. Benjamin Hoadley (1676-1761), The Common Rights of Subjects, Defended: and the Nature of the Sacramental Text, Consider'd (1719). John Locke (1632-1704), Epistola de Tolerantia (1689), trans. A Letter Concerning Toleration (1689). ----, A Second Letter concerning Toleration (1690). ----, A Third Letter for Toleration (1692). ----, "Part of a Fourth Letter for Toleration" in Posthumous Works (1706). Edmund Ludlow (1617?-1692), Memoirs (1698-99), 3 vols. Catharine Macaulay (1731-1791), The History of England, from the Accession of James I to that of the Brunswick Line (1763-83) 8 vols. Vols. 1-5 (1763-71) appeared in Hollis's lifetime. ----, Loose Remarks on certain Positions to be found in Mr. Hobbes's Philosophical Rudiments of Government and Society (1767). ----, Observations on a Pamphlet, Entitled, Thoughts on the Cause of the Present Discontents (1770). Andrew Marvell (1621-1678), An Account of the Growth of Popery, and Arbitrary Government in England (1677). ----, The Rehearsal Transpos'd: or, Animadversions shewing what Grounds there are of Fears and Jealousies of Popery (1672-73). Conyers Middleton (1683-1750), The Miscellaneous Works (1752), 4 vols. John Milton (1608-1674), Eikonoklastes in Answer to a Book Intitl'd Eikon Basilke (1642). ----, Of Education, to Master Samuel Hartlib (1644). Edward Wortley Montagu (1713-1776), Reflections on the Rise and Fall of the Antient Republicks. Adapted to the Present State of Great Britain (1759). Henry Neville (1620-1694) (1620-1694), Plato redivivus: or, a Dialogue concerning Government (1681). Algernon Sidney (1622-1683), Discourses concerning Government (1698). ----, Letters and Memorials of State written and collected by Sir Philip Sydney, Colonel Algernon Sidney, faithfully transcribed from the Originals by Arthur Collins (1746) 2 vols. ----, Of the Use and Abuse of Parliaments; in Two Historical Discourses (1744). 2 parts in 2 vols. First Part "A General View of Government in Europe" by Sidney. John Toland (1670-1722), "The Life of the Author" prefixed to A Complete Collection of the Historical, Political, and Miscellaneous Works of John Milton (1698) 3 vols. The Life printed separately 1699. ----, The Oceana of James Harrington, and His Other Works, collected, methodiz'd, and Review'd, with an exact account of his life prefix'd by John Toland (1700). John Trenchard (1662-1723), An Argument, Shewing, That a Standing Army is inconsistent with a Free Government, and absolutely destructive to the Constitution of the English Monarchy (1697). Written with Walter Moyle, who alone wrote The Second Part of an Argument (1697). ----, Cato's Letters written with Thomas Gordon. Letters through March 1721 republished in 3 separate Collections (1721). The entire series republished with 6 new letters by Gordon in 4 vols. (1723-24). Caroline Robbins, "Library of Liberty - Assembled for Harvard College by Thomas Hollis of Lincoln's Inn," Harvard Library Bulletin V (1951): 5-23, 181-96. Appendices. Absolute Liberty: A Selection from the Articles and Papers of Caroline Robbins, with a Foreword by J.H. Plumb, edited by Barbara Tafr (Archon Books, 1982). W.H. Bond, Thomas Hollis of Lincoln's Inn: A Whig and His Books (Cambridge University Press, 1990, 2009). 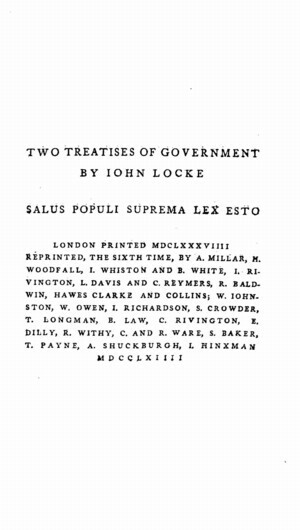 Left: From the title page of the Hollis edition of John Locke's Two Treatises of Government London, 1689; reprinted 6th time London: A Millar et al., 1764). The text is in Hollis' standard classical format - simple capital letters to replicate the look of a Roman inscription. The motto reads: "Salus Populi Suprema Lex Esto", a Latin phrase meaning "Let the welfare of the people be the supreme law." This was adopted as the official motto of the State of Missouri. 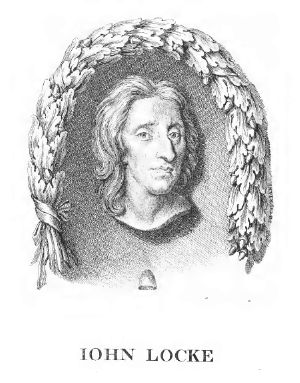 Right: the head of Locke surrounded by a single wreath of oak leaves and a liberty cap below centre. Description: Locke’s most famous work of political philosophy began as a reply to Filmer’s defense of the idea of the divine right of kings and ended up becoming a defense of natural rights, especially property rights, and of government limited to protecting those rights. This 1764 edition is famous for being the edition which was widely read in the American colonies on the eve of the Revolution. Left: Title page of the Hollis edition of Locke's Letters concerning Toleration (London: A. Millar et al., 1765). The text is in Hollis' standard classical format - simple capital letters to replicate the look of a Roman inscription. The quotation is from Milton's Paradise Lost, Book 12, lines 529-532: "for on earth, who against faith and conscience can be heard Infallible? yet many will presume: whence heavie persecution." Right: the head of Locke surrounded by a single wreath of oak leaves and a liberty cap below centre. The high resolution scan shows the artist Cipriani's name at the bottom right end of the wreath. 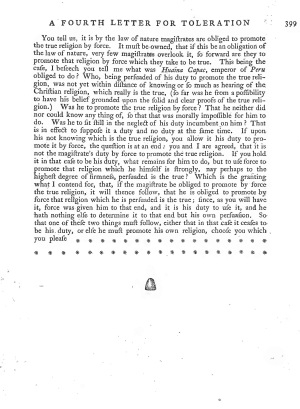 Lower image: the final page of the book shows Hollis' emblem of the liberty cap at the very end of the text.